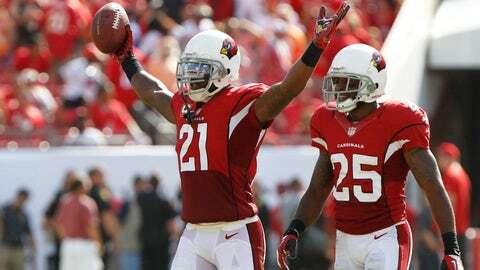 Patrick Peterson, left, and Jerraud Powers appear set as the Cardinals' starting cornerbacks heading into 2014. FOX Sports Arizona is conducting a position-by-position analysis of the Arizona Cardinals, examining their personnel’s strengths and weaknesses, the team’s free agents at that position and the team’s draft or free-agent needs. Peterson has inexplicably come under fire from critics despite taking on the opponent’s top receiver every game and doing a good job in his third season. Some have labeled Peterson arrogant — a trait reporters who cover the team every day simply don’t see — and some think he has underperformed. Is Peterson one of the top handful of corners in the NFL? Maybe not yet. Opposing quarterbacks completed 54.4 percent of their passes into Peterson’s coverage, according to Pro Football Focus, which ranked just 29th in the NFL, and Peterson scored just the 16th-highest ranking in PFF’s overall cornerbacks ratings, but other factors contribute to a cornerback’s effectiveness, including quarterback pressure and the reliability of the rest of the secondary. The Cardinals are pleased with Peterson’s progress. Peterson is signed through 2014, and the Cardinals can slap the franchise tag on him the year after that, so he’s not getting away any time soon. But they would like to reach a long-term extension with him this offseason to avoid any ill will down the road. Powers had an uneven season, but his better efforts came during the second half, with the exception of a rough game against the Rams. Powers is undersized, which makes his job particularly difficult since opponents regularly pick on him rather than Peterson, but he battles, and coach Bruce Arians loves his leadership abilities. He is signed for two more years, so the Cardinals starters appear set, although Powers’ cap hit next season ($4.75 million) more than doubles from what it was in 2013 ($2 million). Mathieu is a free safety, but he moved to cornerback in nickel packages and was extremely effective in that role until a knee injury sidelined him for the season on a kick return Dec. 8 against the Rams. The major offseason question for Mathieu is how quickly he can recover — and how well can he recover. With a torn LCL and ACL, the recovery time would suggest he won’t be back for the start of the season, so the Cardinals will need at least short-term help. Cason played well once Mathieu went down and may have deserved a chance to replace Powers in the starting lineup. He had two crucial interceptions in an overtime win at Tennessee. 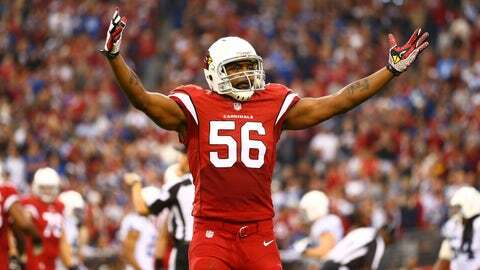 He’s an unrestricted free agent, though, and will likely be looking for a greater role than he enjoyed in Arizona. Arenas didn’t see a lot of time other than on special teams and could also test the market for a better opportunity. Bethel excelled on special teams — so much so that he made the Pro Bowl — but he said after the season that his offseason work will be focused on becoming a regular part of the cornerback rotation. That means becoming stronger against the run and improving his technique to make up for his lack of weight against bigger receivers. There is no questioning his speed. McCann was a valuable reserve and could return in that role. With three unrestricted free agents, the Cardinals may need to shore up their depth. Cason and Arenas want bigger roles than they enjoyed in Arizona last season. As last season’s injuries proved, it’s never a bad thing to have a healthy reserve of capable cornerbacks. However, there are more pressing needs on the roster, and this is considered a deep cornerback class, so the Cardinals may be able to sign capable rookie free agents or get a corner with a late-round pick. Darqueze Dennard, Michigan State; Justin Gilbert, Oklahoma State; Jason Verrett, TCU; Marcus Roberson, Florida; Bradley Roby, Ohio State; Lamarcus Joyner, Florida State; Kyle Fuller, Virginia Tech; Louchiez Purifoy, Florida; Pierre Desir, Lindenwood; Victor Hampton, South Carolina; Stanley Jean-Baptiste, Nebraska; Terrance Mitchell, Oregon; Keith McGill, Utah; EJ Gaines, Missouri; Ross Cockrell, Duke; Jaylen Watkins, Florida; Bashaud Breeland, Clemson; Rashaad Reynolds, Oregon State; Chris Davis, Auburn; Nevin Lawson, Utah State; Deion Belue, Alabama; Walt Aikens, Liberty; Antone Exum, Virginia Tech; Bennett Jackson, Notre Dame; Ricardo Allen, Purdue; Bene Benwikere, San Jose State; Andre Hall, Vanderbilt; Aaron Colvin, Oklahoma; Lavelle Westbrooks, Georgia Southern; Carrington Byndom, Texas; Charles Sawyer, Mississippi; Phillip Gaines, Rice; Osahon Irabor, ASU.